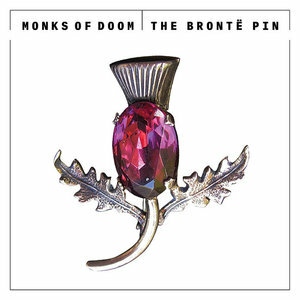 After a criminally long wait, Monks of Doom shower us with bold new material on The Brontë Pin. Unless you're Adele, Beyonce, or U2, writing, releasing, and recording new music these days can be an absolute uphill slog. Victor Krummenacher told me himself in an interview to promote the Camper Van Beethoven album La Costa Perdida, calling the paycheck for a four-week tour "ridiculous". Fortunately a guy like Krummenacher has a solo career and another rock band to round out his portfolio. It wasn't until I started reading the press material that I realized that, holy cow, his other band Monks of Doom haven't had an album of original material in 26 years! The last time they recorded together -- a full 12 years ago -- was to make an album of covers. What's Left for Kicks? found them performing songs by Wire, Neu!, Nino Rota, and Rashaan Roland Kirk. Yeah, not exactly your average covers album from a rock band, but then Monks of Doom were never an average rock band. Including three members from Camper Van Beethoven (Krummenacher, Greg Lisher, and Chris Pedersen) and one member from Counting Crows (David Immerglück), this was a group that could bring any odd musical notion to their collective table that did not jive with their regular bands, mixing aggressive instrumentals with odd indie pop. Hence, making sellable commodities was probably not on their list of priorities. Still, how did the music business get so thin? Why does a band like Monks of Doom have to take a 12-year hiatus from the recording studio? What matters now is that we have their latest album The Brontë Pin to hold and admire, a brash reminder of why their name commands a certain amount of respect when it comes to skewed rock music. The Monks of Doom start the album by alternating from instrumental-to-song-to-instrumental-to-song, but give up on the formula after they put three instrumentals back to back. The instrumentals beat out the "songs" by seven to five, giving a clear picture of just how much the Monks of Doom like to play around with sounds. Yet The Brontë Pin remains tightly focused, never succumbing to absent-minded noodling. Krummenacher, Immerglück, Lisher, and Pedersen have been around long enough to recognize that improvised rock shouldn't bore the listener. If you find that you really don't care for the musical stylings of The Brontë Pin, you should at least recognize that this album is the opposite of boring. Singling out a centerpiece track is a worthless exercise since so many of them thrive on such different identities. For instance, "Duat! Duat!" is a quick waltz riding on a melody borrowed from a region far east of the Americas. Hit the skip button a couple of times, and you get "Boar's Head", a piece of finger-plucked American primitive with wordless vocalizations. Hit the skip button two more times, and you're at "23rd Century Hard Bop", a rawk riff so bone-headed that it can't possibly qualify as futuristic. The songs themselves are just as disparate. "The Bastards Never Show Themselves" is just waiting to burst out of its whisper-quiet dynamic, leaving the tension to simmer all the way to the end. That overdue rupture finally happens on "Up From the Cane" with noisy bass, slide guitar, and a Keith Moon drum beat. "John the Gun" is probably the closest this album gets to a relaxing state, which isn't saying much once you hear the ominous chorus and the sun-scorched guitar solo. The Brontë Pin is part psychedelic, part prog, part folk, mostly rocking, and all delightful. It really is a shame that bands like Monks of Doom do not have the luxury to put out albums at a steady rate. If The Brontë Pin is indicative of what we're missing out on by letting veteran indie bands rely on paychecks from streaming sites, then we're doing ourselves a disservice. But hey, at least it exists, right?